Brevet Colonel Count (Albert) Edward (Wilfred) Gleichen, later Major General Lord Gleichen (1868-1937). Sitter: Brevet Colonel Count (Albert) Edward (Wilfred) Gleichen, later Major General Lord Gleichen (1868-1937). 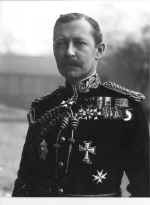 Biog: Intelligence Officer, Major General and author; Extra Equerry to Queen Victoria 1892-1901, King Edward VII 1901-1910 and King George V.
Occasion: (Assistant Director of Military Operations, War Office from 1 February 1907-31 July 1911). Costume: Full Dress uniform, Equerry to the King. Star of the Order of Medjidjie (2nd class) [Ottoman Empire]. 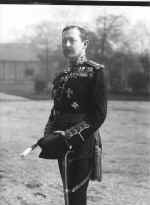 Biog: Marquis of Ruvigny ed., The Titled Nobility of Europe, London, 1914; Who's Who; The Army List, 1907; The Times, 16 December 1937, p 16a; Sir O' Moore Creagh and E. M. Humphris, The Distinguished Service Order 1886-1923, London, 1973, p 113. (Campaign medals) E.C. Joslin, A.R. Litherland & B.T. Simpkin, British Battles & Medals, London, 1988. Acknowledgements: (Orders etc) David Bownes, (Star of Ethiopia) David Stanley. 1. Count Gleichen's medals were sold at Spink's Medal Auction, 6 December 1990, see Spink Medal Auctions, catalogue, Winter 1990, lot 410.